A brief announcement provides updates of OA-6 and MUOS 5 from ULA. ULA successfully delivered the OA-6 Cygnus spacecraft to its precise orbit as planned on March 22. During the launch, the system experienced a premature first stage shutdown. Atlas is a robust system. The Centaur upper stage compensated for the first stage anomaly, delivering Cygnus to a precise orbit, well within the required accuracy. The ULA engineering team has reviewed the data and has determined an anomaly with the RD-180 Mixture Ratio Control Valve (MRCV) assembly caused a reduction in fuel flow during the boost phase of the flight. In addition to analysis and testing, all RD-180 engines are being inspected. 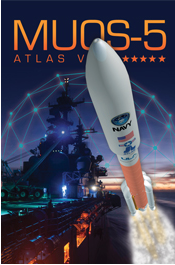 Rocket/Payload: An Atlas V 551 will launch the U.S. Navy’s fifth Mobile User Objective System (MUOS-5) satellite, built by Lockheed Martin. Date/Site/Launch Time: Space Launch Complex-41 at Cape Canaveral Air Force Station, Florida. Mission Description: The fifth Mobile User Objective System (MUOS-5) satellite is the latest addition to a network of orbiting satellites and relay ground stations that is revolutionizing secure communications for mobile military forces. Users with operational MUOS terminals can seamlessly connect beyond line-of-sight around the world and into the Global Information Grid. MUOS’ new commercial, cellular-based capabilities include simultaneous, crystal-clear voice, video and mission data, over a secure high-speed Internet Protocol-based system. Launch Notes: MUOS-5 will mark the ULA’s fourth launch of 2016 and the 63rd Atlas V since the vehicle’s inaugural launch in August 2002. MUOS-5 will be the seventh mission to launch in the 551 configuration; other missions launched in this configuration include four previous MUOS missions as well as the New Horizons mission to Pluto and the Juno mission to Jupiter.